International Book Giving Day (IBGD) is an annual event that takes place on February 14th and it’s one of our favourite days of the year! Here at Story Snug we’re delighted to be part of the International Book Giving Day team and as well as helping to spread the word about the day we can’t wait to reveal this year’s new poster in just two days time! Today we have been joined by organiser Emma Perry who tells us more about International Book Giving Day and how you can get involved. Hi Emma, thank you for joining us on Story Snug. Can you tell us what International Book Day is and how it all started? Hi Catherine – thanks for inviting me, I love the chance to chat about books! #bookgivingday started back in 2012. The idea was conceived by American book blogger Amy Broadmoore and her son, just days before 14th February. They saw an opportunity to get books into the hands of as many children as possible, they rounded up a few online friends – including myself … and it’s grown and grown from there into something truly international. Why was February the 14th chosen as International Book Giving Day? Amy and her son love books – it made sense to do something book themed for Valentine’s Day. What does the organization of International Book Giving Day involve for you? There’s plenty to keep me busy – finding a lovely illustrator is the big, exciting task. A team of lovely bloggers have been behind #bookgivingday since its inception – they are an important driving force behind the initiative as they help to spread the word and inject their own bookish enthusiasm every single year. I couldn’t manage without them! 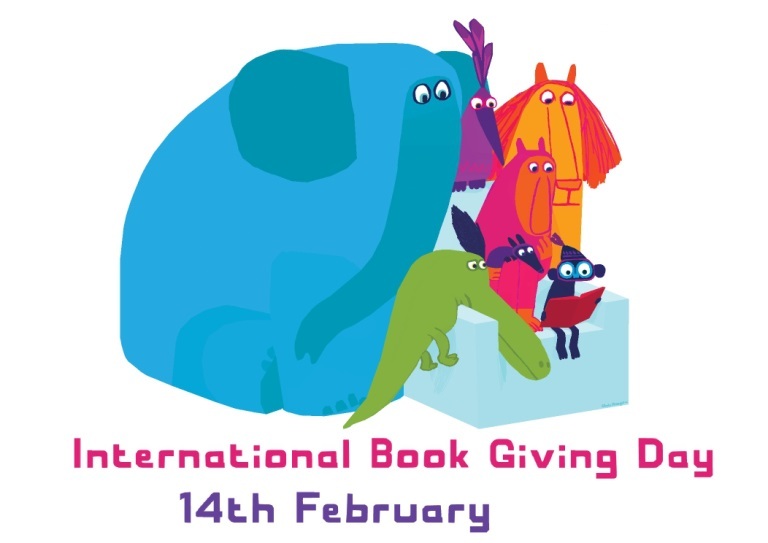 Each year International Book Giving Day has a new logo. How is the poster’s illustrator chosen? Ah yes, the official poster. I adore revealing this each year, and my, we’ve been lucky enough to find some wonderful, wonderful people who’ve generously given their time and creative skills to #bookgivingday. Chris Haughton’s poster was wonderfully vibrant, Anna Walker created a beautiful bookmark as did Gus Gordon, Marc Martin, Tim Budgen … oh, there are many more – you must check them out. Wonderful creations to help people give books on 14th February. Could you give us some examples of what people and organisations have done in previous years to celebrate International Book Giving Day? The creativity and generosity of people from so many different countries leaves me open mouthed with wonder every single year. Books have been sent to child refugees in Calais, France (thanks to one of our founding members Zoe, Playing By The Book); a new library was created in Cape Town, South Africa by one of our team members; in Uganda the Mpambara-Cox Foundation gifted books to children, for many it was the first time they have been given a book of their own. In 2014 Scholastic Australia went to the Melbourne Children’s Hospital and gifted a book to every child. People continue to be creative in so many different ways, all keen to share the love of books. You can see even more lovely examples here. Can you give us an idea of how many countries have taken part in activities for International Book Giving Day? Ok here goes – Nepal, India, Canada, South Africa, UK, France, Germany, Australia, New Zealand, Italy, Nigeria, Fiji, Czech Republic, USA, Cambodia, Hungary, Philippines, Brazil, Romania … I think that’s everyone. How can people reading this blogpost get involved in International Book Giving Day? How and where can people give books? First – subscribe to the website. We currently have over 11,000 book givers being kept up to date – that is very important. Second – the only limit is your imagination. Gift books to a local school or nursery, hospital or waiting room. Find an established book charity in your country that you can give extra support to on the day, and maybe beyond. The website itself is chock-a-block full of inspiration, there’s even a guide to running your own Book Swap. Remember to send us your pics – via social media is great – and we’ll include them in our round up during and after the event. Tell us where you are and what you are up to. Remember to use the hashtag #bookgivingday. What will you be doing for International Book Giving Day this year? My absolute favourite way of participating is as follows – I print out heaps of bookmarks and bookplates then tuck them into all the books I plan to give away on #bookgivingday. On 14th February itself we go out as a family and leave the books for people to find – playgrounds, benches, waiting rooms etc. Waiting to see who will collect it is great fun. We’ve learnt to put clear labels on the books – ‘Take Me Home’ – as generally people don’t expect to be given things for free!! The rest of my day is spent collating the photos as they come in, and gasping at peoples’ generosity. For up to date information about International Book Giving Day you can follow on Twitter, Instagram and Facebook. You’ll also find more information on the International Book Giving Day website. It would also be fantastic if you could share this and any other International Book Giving Day posts on social media to help us spread the word. Don’t forget the hashtag – #bookgivingday. Emma Perry now lives in Bath, UK having spent a lovely 5 years in Melbourne, Australia. 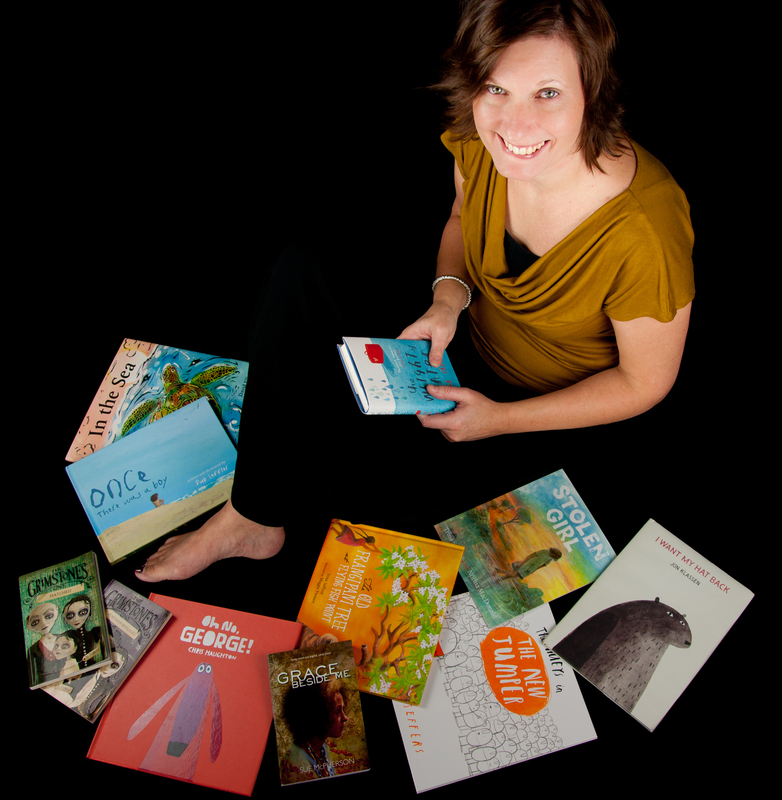 She’s a writer, reviewer, founder of My Book Corner and organiser of International Book Giving Day. She studied English Literature at Kent University and teaches at Primary Schools in her spare time. January 9, 2017 in Audio Books, Chapter Books, Guest Bloggers, Non Fiction, Picture Books, Translated Books. ← Story Snug’s 2016 top ten most viewed posts! Thanks, Catherine. I’ve just subscribed to the IBGD website and am busy thinking about fun giveaway opportunities. Wow, what a great idea! I especially love the idea of helping the children in Calais. I’ve just given a pile of books to my daughter’s school library, so I guess I did my bit a bit early! Thank you so much for this excellent article! I’ve been celebrating this day for years, so happy to see how much momentum it’s gaining. One way I will be having a share this year is by partnering up with some fellow authors to host a blog hop, and giveaway for #Bookgivingday. Awesome! Thank you so much, Catherine! Hi Catherine, what a wonderful thing to do. Books are not so easily accessible to everyone, and the joy a book can bring is priceless. To see the expressions children’s faces as they come across the books that Emma plants must make her feel all warm and fuzzy inside. Proper lovely. How wonderful! I didn’t know this day existed. What a fantastic idea. Hi Catherine, picking up a book to get lost in its pages is one of life’s small pleasures and something every child should be given the change to enjoy. When I was pregnant I remember being excited by the books I could read to my children rather than by cute clothes. To this day my daughter still loves to read, my son not so much anymore. which is a shame.International Book Giving Day sounds the perfect way to spread some book joy.